Photograph shows two men and a cart full of lumber at a street intersection. 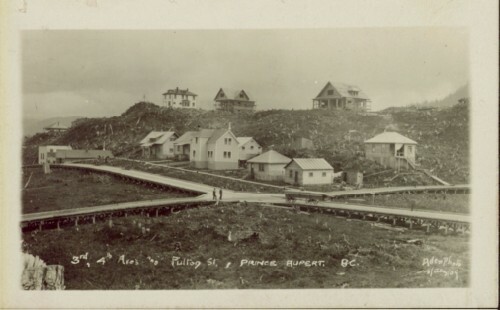 Various residential buildings are visible in the background and atop a large clear cut hill. Annotation on recto reads: "3rd, 4th Aves and Fullton St. Prince Rupert. BC. Allen Photo 8/Aug/09."